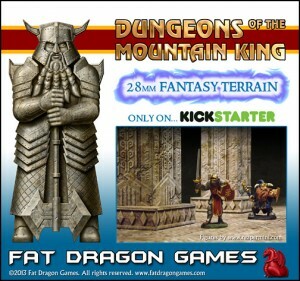 Fat Dragon Games has launched their Kickstarter project for their Dungeons of the Mountain King modular terrain set. Fat Dragon Games' latest Kickstarter project is a dwarven kingdom terrain set in 28mm scale. This Kickstarter project offers four separate terrain sets, Halls of the Mountain King, Dungeons of the Mountain King, Caverns of the Mountain King and Caverns of the Drow.